You are here: Home / Crochet Other / Link Parties / Featured Favorites: 3 Free Crochet Patterns this week! Featured Favorites: 3 Free Crochet Patterns this week! Hi Everybody! Welcome back to Link and Share Wednesday! This week your featured favorites include 3 free crochet patterns! Make this adorable crochet owl purse for a gift for someone near and dear, or get ready for the winter season (brrrr!) by building your own crochet snowman. Looking for something for yourself or a grown-up friend? Why not crochet this lovely sparkly shawlette design? Perfect for the hostess this holiday season! Add your projects this week and be sure to pin your favorites too! PS: Don’t forget about our Giveaways!!! 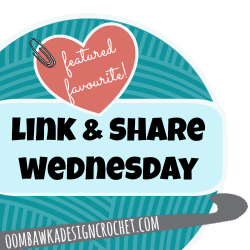 Here are your featured favourites from last week’s Link and Share Wednesday – Link Party 159 as chosen by you! . 3 Free Crochet Patterns This Week! **Many of the projects included in our Link & Share Wednesday have been created using other Designer’s Patterns. You will find the links to the original pattern source(s) included in the Project Posts. If you are one of this week’s Featured Favourites, you can grab a Featured Favourite Button (below) and display it proudly on your blog too! Fabulous! I want to participate, I think you will have one today, right?